In Florida, controversial laws are passed by the Florida Legislature all of the time. One such controversial law is Florida Statute 768.0755 relating to slip and falls at a business establishment. This Statute was passed in response to an outcry over fraudulent claims being filed in Florida by criminals and con artists who were faking injuries in order to get paid by an insurance company. While it may have helped prevent crime, the new law also makes it difficult for slip and fall victims to get compensation for their injuries. Why? Because a victim now has the burden of proving a business owner’s knowledge before a victim can prevail with their claim. Who Has The Burden of Proof In A Florida Slip and Fall? Under Florida Statute 768.0755, the “burden of proof” in a slip and fall claim has been shifted to the injured victim. Before this statute was passed, a business owner had to provide evidence that they weren’t to blame for a slip and fall accident. That requirement no longer exists. In fact, after the law was passed, the business owner doesn’t have to prove anything until after the injury victim has met his or her burden. Which means, a slip and fall victim has to gather witness testimony, video evidence, documentary evidence, and the like, – evidence that can be admitted under Florida’s rules of civil procedure – in order to have a valid injury claim under Florida law (even though Florida Statute 768.0755 does not affect any common-law duty of care owed by a person or entity in possession or control of a business premises). The evidence gathered by a victim must show that the business owner had notice — actual or constructive — that there was a dangerous situation on the property that might cause someone to fall. According to the Florida Supreme Court, someone hurt in a slip and fall must have proof “… that the owner negligently failed where the law, custom, or innate danger requires diligence.” Heps v. Burdine’s, Inc., 69 So.2d 340, 341-42 (Fla.1954). Finding that proof can be difficult because an injured person has to gather evidence about what the business owner knew or should have known. Now that a slip and fall victim has a burden of proof to overcome, the insurance adjuster, and the defense lawyers, focus on poking holes in the victim’s evidence. 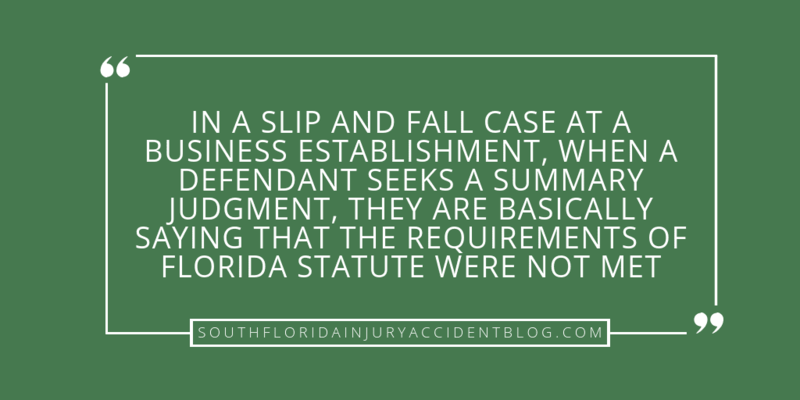 In a slip and fall case at a business establishment (where the victim fell on a transitory substance), when a defendant seeks a summary judgment, they are basically saying that the requirements of Florida Statute 768.0755 were not met. The defendant will argue that the injured person failed to prove that the business owner had actual or constructive notice of the dangerous condition that caused the slip and fall to occur. How Does An Injury Victim Overcome A Slip and Fall Summary Judgment Motion? In most cases, there is a witness when there is a slip and fall. They can provide a statement (written or oral) of what happened when the victim fell, including describing how long the water sat on the floor, or how the business owner had to know the wet napkins were there outside the restroom door, in order to prove the business’ notice of the dangerous condition. They can provide video evidence too (these days, everyone has a camera on their phone). Witness testimony, a lot of times, is provided by affidavit, where the witness signs a written statement before a notary public setting forth what they observed and what they know about the accident. That document, sworn to under penalties of perjury, is filed in the court record. Documents like medical records as well as the defendant’s business records (floor cleaning and maintenance records and aisle check schedule and log) may be used to fight the defense’s summary judgment motion. Some of these documents must be authenticated as accurate business records, and proved up by affidavits that they are true and correct. These affidavits, usually with the business records attached to them, are also filed in the court record. What Happens At The Summary Judgment Hearing? No witnesses take the stand here. All that happens in a Summary Judgment hearing is that each party gets to make their argument to the judge. The lawyer for the accident victim and for the business owner each try and persuade the judge of their position. After the judge listens to the arguments, and reviews the Motion for Summary Judgment and any written responses (including affidavits, memorandums of law, etc.) the judge issues a ruling (which can happen at the hearing or some time afterwards). What Is The Importance of Having An Experienced Personal Injury Lawyer When Facing A Motion For Summary Judgment? Some slip and fall cases can be complicated. Being able to prove a condition was foreseeable, with competent admissible evidence, is, in some instances, an art form. Florida statute 768.0755 may seem like a straight forward law, but it has been the subject of many appellate court decisions. A good piece of advice if you have been injured in a slip and fall and are facing a motion for summary judgment is to speak with an experienced personal injury trial lawyer before the hearing to learn about some of the issues that can arise during one of these hearings. Most personal injury lawyers, like Alan Sackrin, will offer a free initial consultation to answer your questions.